ALTHOUGH horary astrology conforms to scientific principles in all its parts, it is less rigid than natal astrology; for natal astrology is not only an exact science, but its methods are less dependent upon the personal equation. When a child is born, the time of birth can be ascertained with positiveness and exactitude by any person present; but when an idea is born, the personal equation of the one to whom the idea comes may, under certain circumstances, make it very difficult to determine the exact moment of its birth. The proper timing of the birth of an idea, the birth of a proposition, or the birth of a question depends upon the sympathetic relation of the human mind with the astral world. That this relation is quite dependable is evidenced by the accuracy of the results obtained through the use of horary astrology. Nevertheless, because horary astrology depends upon a mental reaction to a condition existing in the unseen world, it is essentially not so much an exact science as a method of divination. Yet what it lacks in positiveness of method it more than compensates for in wealth of detail. Just what I mean by the greater positiveness of natal astrology may be illustrated thus: Any person born when Mars is rising on the eastern horizon, no matter where he is born or of what people, is warlike and combative in comparison to others of his race. 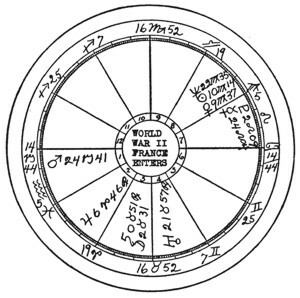 Likewise, in a horary chart, if Mars is found on the eastern horizon, the person asking the question is warlike, or was in a combative mood at the time the question was asked; PROVIDING the Proper time for erecting the figure has been selected. But to determine the time when the question was brought completely into the mind places dependence upon a mental experience. And a mental experience is less positive, as subject to impartial verification by others, than the physical birth of a child. Therefore, horary astrology is not as exact a science as natal astrology. Recognizing this, many beginners in the science make a grave mistake which detracts from their ability to give correct decisions. They feel that because the data upon which it rests is more subject to the personal equation, that they may ignore rules to a greater extent and rely upon intuition. As a consequence, they flit from one section of the chart to another, with little regard to orderly sequence, and do not hesitate to violate such rules as conflict with their impressions. But I have yet to know a practitioner of horary astrology upon whose judgment reliance can be placed consistently, day after day, who departs from the rigid rules in favor of his impressions. Those who do not firmly adhere to the rules may give wonderful readings at such times as their own chart and the world chart favor it; but they fail miserably and importantly at those times when their own chart and the world chart are afflicted. Yet the astrologer who learns the rules and never, under any circumstances, departs from them, can give an accurate and reliable reading even when his own chart and the chart of the world are all upset. Under these adverse circumstances, when he goes beyond the rules and relies upon psychic impression for more details, he may be in error. But, because by following the rules he has eliminated much of his personal equation, in all important respects his readings are consistently reliable. My advice to any student, as derived from the many years horary astrology has been taught in The Church of Light classrooms, is to cultivate the ability to get as great a wealth of detail as possible beyond the strict letter of the rules given; but always to apply the rules in a careful, thorough, and systematic manner: and never, under any circumstances, render a judgment contrary to the rigid rules of the science. Nor should the horoscope be considered merely as a mystical design. On the contrary, whatever the status of the data upon which it is erected may be the chart itself is a positive and exact map of actual forces. It shows, with all the precision of exact science, the direction from which streams of energy, of designated quality and volume, flow to the world. These streams of energy, which can not be seen by the human eye, are quite as real and far more important than the electromagnetic waves, which likewise invisible, flow from the sun simultaneously with the appearance of sunspots, and often cause serious electrical storms on the earth. Now if we increase the temperature of a room sufficiently, those in it will begin to think about opening the doors and windows, or about discarding some of their clothing. If a man partakes copiously of alcohol, he becomes abnormal both in thought and action. If a man is thrown into deep water, he thinks of swimming. Place him on a horse, and he thinks of riding. And any number of other incidents can be cited to illustrate that man’s thoughts and actions are greatly influenced by his environment. Yet the physical is but a small part of his total environment. Quite as important, in influencing his thoughts and actions, are his astral surroundings; and particularly those streams of energy that flow from the planets and impinge upon his finer body. They cause changes in his astral form, and these are registered as sensations by the soul, which is commonly termed the unconscious mind. Because the astral body has certain sensations, the unconscious mind has certain thoughts; just as when the physical body, as illustrated above, registers certain sensations, there are appropriate objective thoughts. Yet psychologists have conclusively proven that most of man’s thinking is done below the threshold of objective consciousness, in the unconscious mind. They have demonstrated that a majority of man’s actions and decisions, instead of being determined by pure objective reason, rise into his objective consciousness as thoughts, impulses and inclinations, from the region of his unconscious. And thus it is that man’s thoughts, as well as his actions, are so largely modified by his astral environment, as it exists at any particular time. These thoughts that enter, or reside within, the unconscious mind, are not mere nothings. They are real organizations of astral substance. 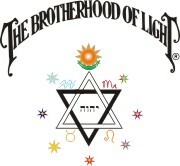 They obey the well known Law of Association, which controls all mental processes. They combine to form a plan, a question an enterprise or an idea. through definite attractions. That is, to state it briefly; the power of any thought to influence other thoughts depends upon the amount of energy it possesses and the completeness with which lines of association have been formed between it and the other thoughts. If we consider any given thought, then, and suppose that additional energy is supplied to it by a stream of force of like quality from some planet, it will be seen that its power, for the time being, is greatly increased. It, therefore, has greater ability to combine with other thoughts. And if several thoughts receive such additional energy from the planets at the same time, all will have additional combining power, and due to their temporary strength, they will be likely to move together as a plan, a question, or an idea. With so much energy at its command this plan, question, or idea then probably will make itself prominent in the objective mind. But the important circumstance of this process, in so far as horary astrology is concerned, is that by determining the quality and nature of the streams of force that give such a plan, question, or idea power enough to become a cause of serious consideration, we thereby determine the quality and nature of the thoughts so energized. Furthermore, by considering the relationship of these energies we can also determine whether or not the plan, question, or idea is harmonious or discordant. In fact, the whole astral relationship is laid bare. 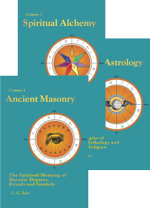 To explain the basic principles upon which horary astrology rests requires a review of the properties of the astral world, a more detailed account of which may be found in Chapter 2 (Serial Lesson 40), Course I, Laws of Occultism. Thus, while not all things in the astral world have physical counterparts, all thoughts, objects and conditions of the physical world have a duplicate in the astral. Furthermore, events and conditions that occur upon the astral plane tend to reproduce themselves, in so far as the physical environment with which they are associated is capable of such reproduction, UNLESS, before the physical environment has time fully to respond, other and contradictory changes take place in the astral environment which annul the first influence. As explained in Chapter 1 (Serial Lesson 118), Course XI, Divination and Character Reading, the soul on the inner plane can look along the world lines of things and perceive them as they existed in the past or as they will exist in the future. Also as velocity there is greater than that of light, there is freer interaction between thoughts and entities on this astral plane. If a serious question, or a proposition, or an event, arises on the physical plane, we may be sure, therefore, that the same question, or proposition, or event has first arisen on the astral plane. And this brings us to the first factor of basic importance in horary astrology. For if the proposition or question has arisen seriously in the unconscious mind, this has already, before the matter has reached the objective consciousness, directed the unconscious mind to all the factors and conditions related to it. And the unconscious mind, because it occupies the inner plane and uses the senses and superior conditions of that plane to apprehend the various conditions, mirrors these various factors in detail in their correct relations. The desire of the unconscious mind to know about the matter has focused its attention on all the factors as they exist in the astral world, and they are present in the soul much as the image of a future picture is reflected in the "finder" of a camera. They have been brought to a focus all in their proper relation, but they only foreshadowed the future picture; for the picture may never be taken, the exposure never made, and the film never developed. Thus when we earnestly ask a question, we may know that already the unconscious mind has imaged the picture in its "finder." Unless there are compelling circumstances, if our inspection shows the light to be bad, the background poor, too much movement, or for any cause the composition to be unpleasing, we may decide not to make the exposure; for we know the picture would be a poor one. If, however, the exposure is to be made in spite of conditions, the "finder" of the unconscious mind shows just what the developed picture will look like. Now why did we ask this question just at this time? Well, if two or more thoughts receive, at the same time, strong stimulation from planets prominently situated, there may be enough energy present to amalgamate them into a plan. If the relation between the planets thus stimulating the thoughts is harmonious, as shown by their aspect, this would favor a harmonious alliance between the thoughts; and a plan that is harmonious in all its parts would result. But if the relation between the two planets thus stimulating the thoughts is discordant, through their being in bad aspect, a discordant condition would be present between the thoughts; for the energy received would be inharmonious and disintegrative. When sets of thoughts thus amalgamate into a plan, or into a definite desire for specific knowledge, if there is sufficient energy present, they rise from the unconscious into the objective mind. In the objective mind they set up a mental disturbance; but except when there is accessory energy of a similar nature from the planets to give them the required force, the plan is not clear and there is no deep desire for a correct answer to a question. We may be quite certain, therefore, that whenever a plan has been completely formulated, or there is a deep desire for a correct answer to some question about our affairs, that the state of mind so stimulated is due to additional energy, received by the mental factors thus brought to our attention, from their corresponding planets. The fact that these mental elements have the power to intrude themselves into objective consciousness so disturbingly, indicates that they have acquired, just at this time, an accessory energy supply. Furthermore, and of even greater importance, the relation of the mental factors thus stimulated by planetary energy is the relation of the planets thus stimulating them into activity. Consequently, by a study of the relationship between the planets at the time a question or proposition becomes clearly defined in the mind we can learn the relation of the mental factors that are most active at the time. This then, is the second of the two factors upon which horary astrology rests. As it is important that this principle be fully comprehended, let me state the matter somewhat differently: A question, for instance, may be present in the mind in a hazy sort of way for days and weeks; but when the planets in the sky reach stations where they hold the same relation to each other that these mental factors do, these mental factors receive enough additional energy, each from its corresponding planet, to give it clear and precise form in the objective mind. If, therefore, a chart of the heavens be erected for the exact moment a serious question takes complete form, it pictures the relation of the various mental factors within the unconscious mind of the person asking the question. 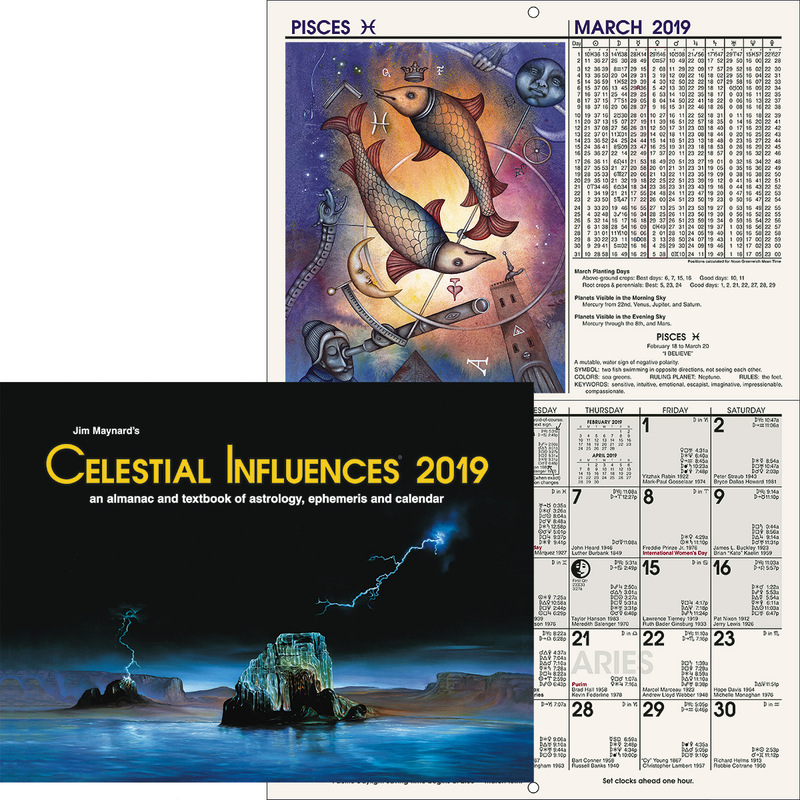 Here we have, then, the two factors that explain just how and why a horary chart, when correctly timed and interpreted, will solve a problem relating to events past, present and future. The first factor is that an earnest desire to know something indicates that the unconscious mind of the person asking the question has been focused upon the problem, and has perceived the various images relating to it, as they exist in the astral world. These images, which are apprehended by means of the superior senses of the astral body, are of astral records of the past, of present interrelations, of past and present relations moving toward combination in the future, or having already combined on the inner plane, but having as yet had insufficient time to externalize. The problem, however, does not present itself to the objective mind when the unconscious first turns itself to it, because it does not have enough energy to link up with the images already in objective consciousness. Instead, just as a photographer awaits the appearance of the sun from behind a cloud before attempting to see how the picture appears in the "finder," so likewise, the image of the factors shadowed in the unconscious mind at first lacks the power to make itself felt strongly in the conscious mind. But when the sun shines brightly in the case of the photographer, and when the planets reach the proper positions in the case of one who unconsciously is pondering a question, energy of sufficient intensity then becomes available to give the image distinct objective form. This brings us to the second factor; which is that a question or proposition that is present in the unconscious mind does not rise clearly into objective consciousness until the planets and signs are so situated that they correspond to the various elements of he matter, and thus add sufficient energy to them that they are thrust up into the objective mind. Thus it is that a proposition or serious question is never born in the objective mind until the planets correspond to its various elements and relations; no more so than that a child will be born and live until the astral vibrations set up by the planets correspond to the astral vibrations within its astral form. A horary chart, then, is a map of three distinct, but sympathetically related, things. It is a map of the heavens at the time and place a question is clearly formulated. It is a map of the most active mental factors within the mind of the person asking the question at the time the question is asked. And, because these mirror the various conditions relating to the question, as perceived on the astral plane by the soul, it is a map of the various factors involved in the question. The problem of the horary astrologer, therefore, is through a careful comparison of the harmony, discord and other relations that exist between these factors, to discern the nature of the past, present and future developments of the matter asked about. He has before him a map of the heavens; but this is also a map of certain related things as they exist on the astral plane. If he discerns, from this map, that several objects are moving toward a given point, he becomes aware from their rate of movement that in about so long a time they will meet. And from the properties of these things, their velocities, and the angle of their approach, he discerns whether they will meet harmoniously or discordantly. From this he can predict, with much certainty, the various results. Furthermore, in case he is so situated that he can not avoid taking and developing the picture, even if in the preview it appears distressing, the astrologer should be able to show him all the details that will help him get the best results from a poor view. The astrologer has watched the taking and developing of so many pictures that have been mapped by planetary positions that he should be able to advise whether or not the venture is worth the attempt, if attempted what the result will be, and how to get the best result if the attempt be made. It is always better to take the time when a question or proposition first is clearly present in the mind. If a proposition of any kind is presented, either personally or through the mail, the moment its import becomes clear is the time for which the chart should be erected. In case his time cannot be ascertained, it is customary to use the time when the question first becomes clear to the astrologer. The experience of a host of astrologers indicates that this latter method is reliable in a general way; for at this time, also, the matter considered is supplied with sufficient energy to make it manifest strongly. But when the time of its first clear formulation in the mind is known, this is the time that invariably should be used. It is the true birth of the question. MERCURY: Lean, nervous, sharp features, small eyes and ears, hair brown. MARS: Wiry, robust body, strong muscles, ruddy complexion, hair with reddish tinge. JUPITER: Large and ample body, sanguine or fair complexion. jovial, with much self esteem. SATURN: Large bones, looks raw boned even when not tall, dark, serious, grave. NEPTUNE: Tendency to weight, oval features, large, dreamy eyes, pleasant appearing. PLUTO: Average height, strong muscular body, deliberate but dynamic personality capable of expressing much force. ARIES: Middle stature, spare, strong body, bushy eyebrows, dark hair, rather swarthy. CANCER: Middle height, upper parts larger, small mouth and face, pale, milky eyes. LIBRA: Tall and well formed, clear complexion, sparkling eyes, hair brown or black. SCORPIO: Middle height, thick set, corpulent, hooked nose, dark hair, ruddy or swarthy complexion. SAGITTARIUS: Above middle height, high forehead, long nose, sanguine complexion, hair brown. The person who asks the question is called the QUERENT. The planet ruling the house that denotes any person or thing is called the SIGNIFICATOR of that person or thing. Any planet sharing the rulership of the house denoting any person or thing is called the CO-SIGNIFICATOR. The planet actually in a house is Chief ruler of that house and Chief Significator of the person or thing denoted by that house; and the planet ruling the sign on the cusp of that house is then the Co-ruler of the house and Co-significator of the person or thing denoted by the house. This is true in all branches of astrology. If there is more than one planet in a house, the planet nearest the cusp of the house is usually the Chief ruler of the house; the other planets being Co-rulers with the planet ruling the sign on the cusp of the house. The planets in the house have more rulership over the house than the planet ruling the sign on the cusp of the house. This is true in all branches of astrology. In horary astrology the First House and the Moon are always taken as Significator and Co-significator of the Querent. The Querent, or person who asks the question, is always represented by any planet, or planets, in the first house, by the planet ruling the first house, and by the Moon as a Co-significator. If the Astrologer is the Querent, asking the question as well as judging it, he is represented by the Significator of the Querent, as just given. But if the Astrologer is not also the Querent, he is signified by the seventh house and its ruler. 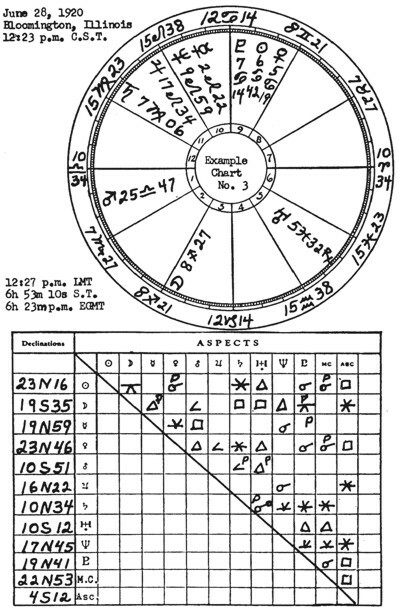 A horary chart is said to be Radical when it is capable of being correctly and safely judged. A figure erected for the exact time of the commencement of any enterprise or event is always a Radical Figure; because it will give correct information. But in a horary question, if less than 3 degrees of any sign, or more than 27 degrees of any sign, be found upon the Ascendant, it is usually better not to try to judge the figure. When less than 3 degrees rise, it indicates that the question is undergoing gestation and is not as yet completely formed. Therefore there is insufficient data upon which to base a correct answer. When more than 27 degrees rise, the question as formulated has been outgrown by new conditions, and these as yet have not been fully grasped by the unconscious mind. The question as asked, therefore, is obsolete, and cannot be answered from the figure. However, if the Ascendant and the planets it contains, together with the sign the planet ruling the sign on the Ascendant is in, describe the Querent’s personal appearance accurately, the figure may be considered Radical in spite of too Few or too many degrees rising. As the 7th house signifies the Astrologer, unless the question relates to the 7th house in particular, when the 7th house is found much afflicted it is often better not to give judgment; for it shows dissatisfaction with the judgment given by the Astrologer and possible trouble for him. Even when the question is a 7th house matter, if nothing but affliction is shown for the 7th house, the Astrologer should proceed with caution, as it indicates little ability on his part to give satisfaction. Two planets are said to be in mutual reception when each occupies the sign which is the exaltation or the home of the other. Thus if Saturn is in Leo and the Sun is in Capricorn, they are in mutual reception. If Jupiter is in Capricorn and Mars is in Cancer they are in mutual reception. When two planets are thus in mutual reception they tend to benefit each other through mutual aims. If at the same time they are in evil aspect, there will be an affliction commensurate with the aspect; but in spite of the aspect, each sets up vibrations in the sign that is the natural medium of the other, and thus renders the other assistance. Mutual reception implies that among some of the things ruled by each planet there will be cooperation. It does not annul the effects of a discordant aspect between two planets. The aspect, good or evil, will work out to its full extent in terms of some of the things ruled by the planets; but the mutual reception will bring about a cooperation between other things so ruled; even if it be an unconscious and unwilling cooperation. Mutual reception should be noted in natal astrology; and is especially important in horary astrology, as it often indicates whether certain things will pull together or fly asunder. The part of fortune is a point on the ecliptic as far removed from the Ascendant by longitude as the Moon is removed from the Sun by longitude. 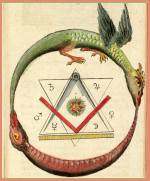 The dragon’s head and tail are the Moon’s nodes. Where the orbital paths of two heavenly bodies intersect is called their nodes. As none of the other planets move in the same plane as the orbit of the earth, each of their orbits must cut the orbit of the earth at two points. Therefore not only the Moon, but each of the planets also, has both an Ascending Node and a Descending Node. If nodes are to be used as sensitive points, logic would indicate that the nodes of all the planets, as well as those of the Moon, should be used. From the standpoint of non-astrological divination, as explained in Chapter 2 (Serial Lesson 119), Course XI, Divination and Character Reading, the more numerous the symbols present from which ESP may take its choice to give the correct impression to objective consciousness the better. But from the standpoint of the Hermetic System of Horary Astrology only those factors should be employed which experience proves actually add accessory energy to the thought cells of the unconscious mind. 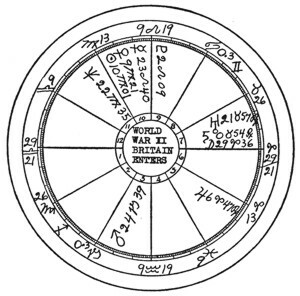 Although many Church of Light ministers who have attained outstanding reputations for accuracy in the practice of horary astrology have started by using the part of fortune and the Moon’s nodes, it became apparent to them as they gained greater proficiency that these symbols in a chart were a hindrance to the reliability of their work. A vast amount of statistical work in natal astrology and over a quarter of a century of checking in class the predictions of students of mundane astrology, together with the experience of these highly proficient horary astrologers, impels me to recommend that fixed stars, part of fortune and Moon’s nodes be omitted from all astrological charts. Probably the most common source of error in horary astrology is a failure to select the house to which the question properly belongs. The astrologer should not be content merely to accept the question as it is given to him; but should carefully interrogate the Querent until he finds out just what it is that he really wishes to know. The Querent may talk about property, or business, when the real thing in the back of his head is money. The question, on the face of it may appear, therefore, to relate chiefly to the 4th house, or to the 10th house; when in reality it is chiefly a 2nd house question in which the 4th or 10th merely indicate a source of revenue. FIRST HOUSE: Everything to do with the personality; health, length of life, temperament and disposition, and personal prowess. THIRD HOUSE: Brethren, neighbors, short journeys, private studies, science, news, rumors, cousins, newspapers, periodicals, letters, messengers, land transportation, and thoughts. FOURTH HOUSE: Home, environment, father, domestic affairs, lands, mines, real estate, houses, hidden things, lost articles, crops, the grave, cities and towns, end of life, and end of any matter. FIFTH HOUSE: Love affairs, children, courtship, theaters, all places of amusement, pleasures, gambling, speculation, hazards, schools, wealth of father, and wealth of city or town. SIXTH HOUSE: Sickness, labor, servants, Inferiors, tenants, farmers, small cattle and poultry, aunts and uncles, foods, army and navy, and ceremonial or other magic performed by the Querent. SEVENTH HOUSE: Marriage, war, partnership, contracts, sweethearts, public enemies, defendant in a law suit, the astrologer, the physician, the opposing party, those met in public, any person inquired about not denoted by one of the other houses, such as a stranger, or a thief when there is a theft. EIGHTH HOUSE: Death, legacies, partner’s money, disembodied entities, and real or personal property when in escrow. NINTH HOUSE: Long journeys, books, publications other than periodicals, advertising, public teaching and public expression of opinion, schooling, philosophy, religion, dreams, visions, and legal matters. TENTH HOUSE: Business affairs, power, rank, position, superiors, the executive head of any enterprise, honor, credit, reputation, profession, and mother. ELEVENTH HOUSE: Hopes, wishes, friends, counselors, acquaintances, praise, friendly criticism, and mother’s money. TWELFTH HOUSE: Private enemies, large cattle, disappointments, sorrows, psychic influences, magic either white or black performed by another, detective work, prisons, hospitals, charitable institutions, and self injury. In a great many of the questions proposed to an astrologer there will be found, either as the chief or as a secondary issue, the desire to know whether or not something will happen. Thus, when the main question relates to the advisability of making some business deal, the Querent nearly always also wishes to know whether or not the deal will be made. Or if the main question is as to marriage, or relating to a journey; in addition to wishing to know if the action should be taken, nearly always there is present a desire to know if, providing the step seems advisable, it can be brought to pass. If the figure shows that the enterprise, whatever it may be, will never mature, it is desirable to know what the causes, persons, or events are that hinder it, and why, and in what manner they frustrate it. But if the event will happen, it is equally desirable to know how it may be brought about, by whom, and in how long a time. There are three different ways by which it is shown that an event will come to pass; and the student should make himself thoroughly familiar with these three ways; for upon his ability correctly to discern them hinges his success or failure in horary astrology. 1. By Aspect: When the significators of the two or more parties to a transaction, or the significators of the factors that must be brought together to produce the event, are found within orb, and applying to any aspect of each other; and this aspect becomes complete before either receives or forms an aspect with another planet—which may be seen by inspecting the ephemeris—it is a testimony that the event will transpire. The strongest aspect to bring a thing about is the Conjunction of the significators. The Conjunction and the Parallel bring matters to pass with ease or difficulty, according to the aspects received from other planets. But they bring things to an issue. When matters are brought about by a Trine they mature with ease, and the event proves beneficial. When matters are brought about by a Sextile there is a favorable opportunity that will yield good results if grasped; and it may be brought to pass without difficulty. When matters are brought to pass by a Semisextile they are usually slightly favorable if they car be consummated; but much initiative is required to bring them about; and they will not come to pass unless there are additional testimonies. The Inconjunct seldom brings matters to fruition. The matter is talked about and thought about, and then dropped. The Opposition aspect sometimes brings an event to pass, though more often not. If it does come to pass it will prove unfortunate, and much difficulty and contention will arise out of it. The Square aspect frequently brings things about; but it shows many obstacles to overcome. The difficulties experienced will be fully equal to the gain derived, and the results will not be as good as expected. The Semisquare and Sesquisquare seldom bring matters to maturity. They show much worry and bickering and little difficulties arising; and either the matter is then permitted to drop, or if there are other helping testimonies, it comes to maturity, but is a source of annoyance, and very little good comes from it. When the significators occupy Powerful Houses the event is more likely to happen; for there is plenty of energy present concerning the matter. When they occupy Feeble Houses it is much less apt to transpire; for there is insufficient energy present, and it comes to naught through indifference. If the significators are Essentially Dignified it assists in bringing the matter to pass, and makes it more favorable than it otherwise would be. Mutual Reception between significators applying to an aspect is a strong testimony that the event will transpire. Mutual reception, if the significators are not at the same time in aspect, tends to bring the significators together, but alone is not of sufficient power to bring the event to pass. If one or more of the significators is Retrograde the matter may be brought to pass, but it will never manifest all that is expected of it. To determine how long before the matter will be brought to pass, the nature of the matter, and its reasonable time limits, must be considered. Then pay particular attention to the signs the significators are in. If in movable signs, the matter will be brought to pass quickly; if in mutable signs, after a moderate time; if in fixed signs, only after much delay. And the significator that applies, indicates the party or thing most active in bringing the matter to pass. In matters that naturally mature very quickly, when the significators are in movable signs, call the number of degrees the aspect lacks of completion, hours. When in mutable signs call the number of degrees apart, days. And when in fixed signs, call the number of degrees apart, weeks. But in matters that mature less quickly call it days, weeks, and months; while in matters that naturally mature very slowly call it weeks for movable signs, months for mutable signs, and years for fixed signs. When one significator is in a movable sign and another in a fixed or mutable sign, the time may be gauged by striking an average. However, in all timing by this method, it will be found when the significators are fast in motion that the event will transpire at an earlier date than that just given, but when the significators are slow in motion that the thing will mature somewhat more slowly than the time indicated by using the signs alone. If, before the aspect is fully complete, one of the significators turns Retrograde and the aspect is not fully formed, that party will back down, or the things denoted by the retrograde planet will take a radical turn about, and the event will not come to pass. If, before the aspect between the significators is perfected, some other planet comes to a complete aspect to either of them, it indicates the interference of a third party or thing—which will be shown by the things which the interfering planet signifies—that comes into the transaction and prevents its maturing as it otherwise would. The significator first receiving the complete aspect from the interfering planet indicates the person or thing first affected by it. If, before the aspect between the significators is perfected, one of them must pass to a different sign, it shows some change in affairs before they are brought to maturity. The matter is thus shifted to a new basis; and if the significators are in Feeble Houses, or in adverse Essential Dignity, and the aspect is not a very strong one, the matter will not come to pass. But if the significators are in Powerful Houses, or Essentially Dignified, and the aspect be a strong one, the matter will come to pass; but not as at first formulated. When a planet makes no aspect with another planet before it passes from the sign it is in, it is said to be void of course. When the Moon is void of course, the matter is seldom brought to maturity. If the figure is not Radical, through having less than 3 or more than 27 degrees of a sign rising, the matter seldom matures. Any enterprise undertaken when the Moon is void of course; or when less than 3 or more than 27 degrees are rising; is seldom a success. It is either premature or out of date. If the significators are not within orb of aspect with each other, or if they are separating from the aspect instead of applying, the event will not transpire; except there is Translation of Light, or Collection of Light. 2. By Translation of Light: When the significators are separating from an aspect, and some other planet forms an aspect to one of the significators and then moves to a complete aspect with the other significator, it is called Translation of Light. It indicates that a person or thing comes in as a go between, or agent, and reconciles the significators and thus causes the event to transpire. The nature of the go-between is indicated by the things ruled by the planet that translates the light. 3. By Collection of Light: When the significators are not within orb of an aspect to each other, or are separating from an aspect, if both form a strong aspect to the same planet, this planet indicates a common acquaintance, or a common cause, working to bring them together. If the planet that thus Collects the Light, through aspecting both significators, is powerful by accidental dignity, or strong by essential dignity, and the aspects are powerful, it will bring the factors together and the matter will be brought to a conclusion. If it is a weak planet and without dignity, an effort will be made to reconcile interests, but it will fail. If the aspects that collect the light are benefic, there will be little difficulty experienced. If the aspects are malefic, there will be difficulty and trouble; and unless the collector of light is very powerful, it may not be brought to pass. When one of the aspects is good and the other discordant, there will be some trouble and some success, the final result depending upon the power of the collector. The ultimatum expired which England gave Germany and England officially entered World War II. This chart must be read as the birth of a British enterprise. It thus represents how Britain will be affected by the war, and not how Germany is affected, except as this can be inferred from the fortunes and misfortunes of Britain. It cannot be read as a contest the nature and time of which was arranged by mutual consent. The ultimatum expired which France gave Germany, and France officially entered World War II. This chart must be read as the birth of a French enterprise. It thus represents how France will be affected by the war, and not how Germany is affected, except as this can be inferred from the fortunes and misfortunes of France. It cannot be read as a contest the nature and time of which war arranged by mutual consent.